Five Star Comics creator Terence Hanley will be at Mysticon, his first science fiction-fantasy-horror convention, this weekend, Friday, February 24, through Sunday, February 26, 2012, in Roanoke, Virginia. This is the second year for Mysticon. Guests of honor include author Sherrilyn Kenyon and actor Richard Hatch of Battlestar Galactica fame. Terence will be in the artists' alley part of the convention. Stop by for a Mothman or monsters and aliens coloring book, a copy of Lucky Girl or Five Star Comics, or a preview of the next Cave Girl story. Terence will also draw pictures made to order. You can find out more about Mysticon at the show's website. 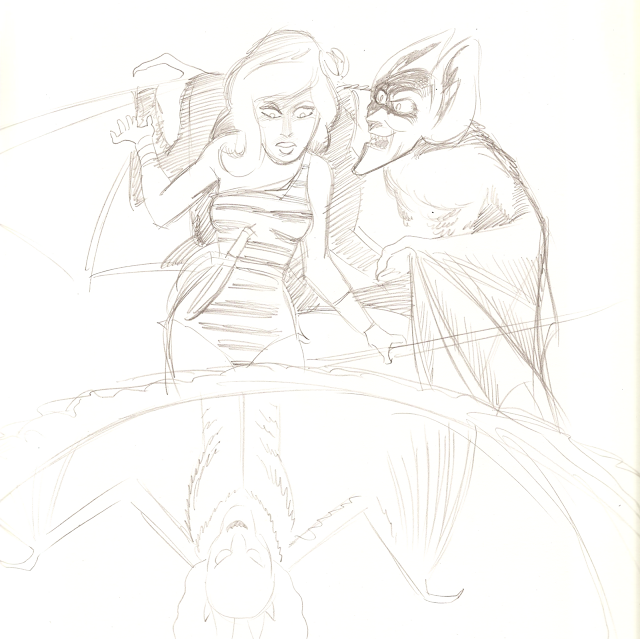 Cave Girl meets the Bat-King!